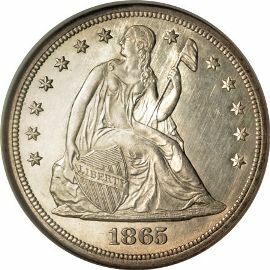 Seated Liberty Dollars (no Motto) Reverse was coined at the US Mint from 1840 to 1865. The early sketches of these coins were completed by Thomas Sully and are inspired by the British coin Britannia. The Mint's assistant engraver, Christian Gobrecht, adapted the sketches to make them suitable for coinage and is credited with the design. silver coinage. A dollar represented approx 20 hours of hard manual labor in that era. The silver dollar was a store of wealth to millions of working class Americans. 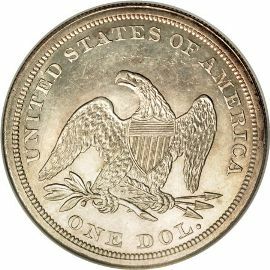 The obverse of this coin shows the same design as the Gobrecht silver dollar that preceded it. Liberty is seated on a rock, right hand holding a Union shield, and left hand grasping a pole with a Liberty cap on top. She is surrounded by thirteen stars and with the date below her. STATES OF AMERICA" and "ONE DOL."